Been watching “Hell’s Kitchen” again, the cooking reality show that’s like a car accident you can’t help but watch. I’m not really sure how they pick the contestants. Why not get a bunch of contestants like they do on “Top Chef”? Anyway, this year’s crop of chefs aren’t all that bad (some are, but most aren’t). It’ll be interesting to see who ends up winning. You can watch the latest episodes on Hulu. 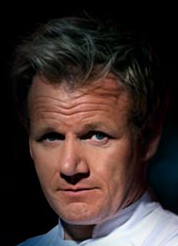 You know, I like Gordon Ramsay. Not for his antics on Hell’s Kitchen, which are pretty much way over the top, but because of the BBC version of Ramsay’s Kitchen Nightmares. He’s tough, but he cares about helping people out of tough spots. If you missed the show, you can watch it before reading further. So, say what you want about the guy, but some of Gordon’s soft touch came through last night when Jason had a meltdown trying to remember the menu. Gordon actually talked him back into the dinner service, but Jason still blew it in the end. Maybe it’s just me, but it seems like there are only about four people on that show that even come close to making it to the end. The rest of them don’t look like they’re going to make it.